Scientists have uncovered a new class of galaxies with supermassive black hole winds that are energetic enough to suppress future star formation. Devoid of fresh young stars, red and dead galaxies make up a large fraction of galaxies in our nearby universe, but a mystery that has plagued astronomers for years has been how these systems remain inactive despite having all of the ingredients needed to form stars. Now, an international team of researchers have used optical imaging spectroscopy from the Sloan Digital Sky Survey-IV Mapping Nearby Galaxies at Apache Point Observatory (SDSS-IV MaNGA) to catch a supermassive black hole in the act of heating gas within its host galaxy, leading to the prevention of star formation. “Stars are created by the cooling and collapse of gas, but in these galaxies there are no new stars despite an abundance of gas. It’s like we have rain clouds hanging over a desert, but none of the rainwater is reaching the ground,” said Edmond Cheung, Project Researcher at the Kavli Institute for the Physics and Mathematics of the Universe (Kavli IPMU), and lead author of a new study published in Nature on May 26. The team studied a galaxy nicknamed Akira, the prototypical example of the newly discovered class of galaxies called "red geysers” - red referring to the color of galaxies that lack young blue stars, and geyser referring to the episodic wind outbursts from the supermassive black hole. Akira showed intriguing and complex patterns of warm gas, implying the presence of an outflowing wind from the supermassive black hole in its center. The researchers say the fuel for Akira’s supermassive black hole likely came from the interaction with a smaller galaxy, nicknamed Tetsuo. The outflowing wind had enough energy to heat the surrounding gas through shocks and turbulence and could ultimately prevent any future star formation. These are some of the early results from the Kavli IPMU-led SDSS-IV MaNGA survey, which began observations in 2014. The technology involved in the new survey allows scientists to map galaxies ten to one hundred times faster than before, making it possible to build large enough samples required to catch galaxies undergoing rapidly changing phenomena. “The critical power of MaNGA is the ability to observe thousands of galaxies in three dimensions, by mapping not only how they appear on the sky, but also how their stars and gas move inside them,” said Kevin Bundy, MaNGA’s Principal Investigator and Kavli IPMU Project Assistant Professor. "Stars form from the gas, a bit like the drops of rain condense from the water vapor. And in both cases one needs the gas to cool down, for condensation to occur. 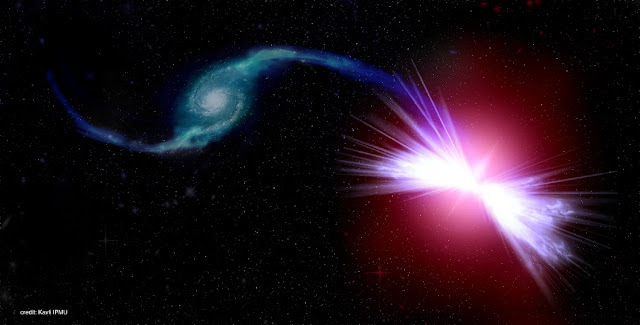 But we could not understand what was preventing this cooling from happening in many galaxies," said co-author Dr Michele Cappellari, from the Department of Physics at Oxford University. "But when we modeled the motion of the gas in the red geysers, we found that the gas was being pushed away from the galaxy center, and escaping the galaxy gravitational pull." The team will continue to analyze the survey’s data and plans a number of follow-up studies to further reveal the role of red geysers on the evolution of galaxies.